Riding on the buzz behind its stellar tumblelogging network Tumblr and its web-based file distribution utility Senduit, the New York based web design company Davidville, Inc. is positioned to make an audible splash. Its solutions are designed with accessibility in mind, making them appealing to even the most basic of users. 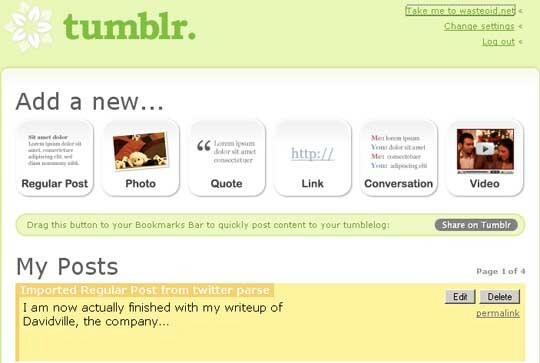 Tumblr is a re-envisioning of tumblelogging, a subset of blogging that uses quick, mixed-media posts. The service hopes to do for the tumblelog what services like LiveJournal and Blogger did for the blog. The difference is that its extreme simplicity will make luring users a far easier task than acquiring users for traditional weblogging. Anytime a user sees something interesting online, they can click a quick “Share on Tumblr” bookmarklet that then tumbles the snippet directly. The result is varied string of media ranging links and text to pictures and videos that takes very little time and effort to maintain. Having just celebrated its one month anniversary (it launched on March 1), Tumblr is already used by a growing legion of over 50,000 users — and the numbers get more interesting from there. For every five users on Tumblr there is one post per hour. Although a Tumblr is conducive to mixed-media posts the creators were initially fearful that Tumblr would be heavily weighted toward only one or two of the available mediums. What they’re finding, however, is a healthy spread of all of the flavors currently available to tumblrs, with photos currently owning 34-percent of the posts and other formats tagging along in close succession. Tumblr utilizes intuitive proprietary web publishing software that offers unparalleled simplicity. In fact, in all of my years online, I’ve never encountered a more transparent publishing utility. There is absolutely no learning curve, just sign-up and start posting. I’ve been running one at Wasteoid.net for about a week now and I’ve tumbled a considerable collection of entries due entirely to its instant gratification posting dynamic. Because of its simplicity, Tumblr finds itself in a doubly strong position. It is poised to gain the attention of the less web savvy masses who have been wondering for some time “what that blogging stuff is all about.” There is no small value in clinching that demographic — the success of MySpace is a resounding testament to that. Perhaps more interestingly though, is its ability to fill the wide gap between social networking sites like Facebook and MySpace and community sites like Flickr, Delicious, etc. Beyond simply posting directly to Tumblr, users can have Tumblr aggregate feeds from many of the other sites on which they propagate. On Wasteoid, for instance, I’ve set my Tumblr to draw my RSS output from Twitter, Digg, Pipes and other sites. The result is something akin to my digital stream of consciousness, consisting of a homogeneous flow of status updates, links of interest, pictures, text, quotes, conversations and practically anything else that crosses my path during the day. And there is still a lot more in the works for Tumblr. In April, it will roll out a collection of Tumblr features designed to fuel its expanding community, including additions to connect tumblrs around content and friends, and transparently interact with users outside the Tumblr network. Continuing down the calendar, their goal for May is to begin offering premium account subscriptions for a nominal fee. While Davidville founder Dave Karp assures me that, “[They’re] committed to continuing to offer free accounts that are more robust and powerful than any of the other web publishing services,” premium accounts will fulfill a fundamental place for the fledgling network. 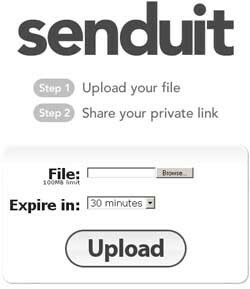 Back in Feb. they launched Senduit, a web-based utility designed to assist in the sharing of large files over the Internet. Since its launch two months ago, site usage has expanded to 250,000 unique monthly visitors. Over 65,000 files are uploaded each month and downloads are in the ballpark of 500,000. The service manages its bandwidth usage through smart throttling measures used to ensure that its not abused or used for spam and warez. All of that said, Davidville, Inc. is a company to pay attention to in the coming months. It has in Tumblr a product that any company would froth wildly at the mouth for, a trendy service that is capable of vast mainstream appeal across the demographic lines. Its products have entered my current stable of web tools and aren’t likely to leave anytime soon.